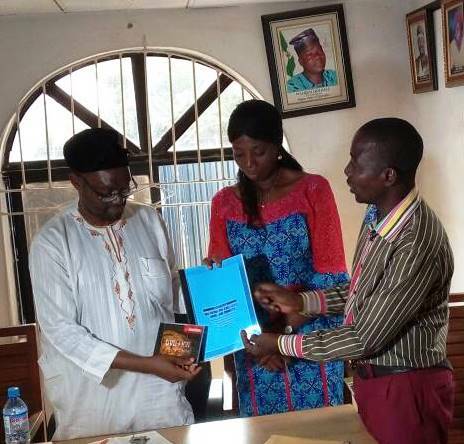 The Nigeria Union of Journalists (NUJ) Lagos State council has received a copy of the Report of Committee on Abarenland and Pen Jewel estate on Friday 2nd March,2018, reports ITRealms. Chairman NUJ Lagos State Council, Dr Qasim Akinreti disclosed this to ITRealms at the weekend, promising to make the full report available as soon as possible. The report, ITRealms gathered indicted the former chairman of the council, Mr. Deji Elumonye and current President of the Nigerian Association of Women Journalists (NAWOJ), Mrs. Ify Omowole. He also commended the Committee members for a thorough job. “I equally appreciate you all for your patience. I promise to guard the integrity of the union ,that had been demonstrated with the outcome of this Committee's assignment. Be assured that the rules and procedures will be followed,” he assured. Equally, he said, the NUJ Lagos State exco will meet on the report with the Chairman of the Abaren / Pen Jewel land had already briefed the secretariat on Thursday on the findings and recommendations. “The Report will be presented to the Congress on March 10th accordingly. Let me appeal to all to exercise patience,” he said, reiterating that the council will leave up to expectations. Already, ITRealms reports that members of NUJ Lagos State council are clamouring for the refund of their money which got entangled in a scam housing project championed NAWOJ including the non-existence of supposed NAWOJ Cooperative Society. Pix: Lagos Council chairman, Dr. Akinreti and vice chairperson, Abiola Beckley receiving the report from Committee Chairman - Fabian Anawo on Friday.